USATestprep is very user-friendly. Students and teachers may begin using the site effectively on the first day of purchase. If desired, we can offer teachers a hosted online training session. The system also offers a series of how-to tutorial videos on a broad range of user topics. 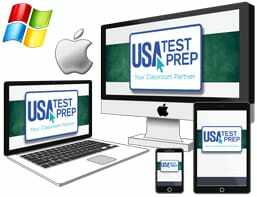 Any Internet-connected computer (PC or Mac) or device can access USATestprep. As a Web-based application, there is no software to install or maintain. The site works with Safari, Firefox, Google Chrome, and Internet Explorer (version 9.0 or higher). We have also tested on Apple iOS, Android, and Kindle devices to ensure core-functionality. Each school receives an Account ID, student activation code, and teacher activation code to access the site. With this information students and teachers create individual accounts. To log in, simply visit the main page and click on the "Login" button in the top right corner. Students type in their Account ID, individual username, and password to begin reviewing the test materials. Your site license provides access for all students in your school, regardless of size. Students and teachers can use the site from school or home — 24/7. USATestprep is offered as an annual subscription. You purchase the rights to use the site for a twelve-month period. We enhance the content and features on a regular basis. Once your students set up individual accounts, their completed activities are saved to the Results area. Teachers can log in with their account and view student progress, track their weak areas, and monitor student activity. We author each individual state test review to specifically match the DOE posted guidelines for that state.